Among all the good things listed, the “and/or” caught my eye, and Elizabeth and I smiled at each other. You know, I thought, if the fishing is halfway decent, I’m really going to like this place. Earlier in the day we had taken an Alaska Airlines flight from Washington Dulles International Airport in Northern Virginia, changed planes in Seattle, Washington, and flew direct to Ketchikan, Alaska. From there we flew in a 1950s vintage DeHavilland Beaver float plane to scenic Thorne Bay on nearby Prince of Wales Island. After touching down lightly on the calm water, we taxied to the floating dock where the entire staff of the Orvis-endorsed Alaska’s Boardwalk Lodge met us and gave us a genuinely sincere welcome that still touches me even today. Strangers at first, these folks became fast friends by week’s end. But isn’t Alaska a cold, frozen place for much of the year, you ask? No, Southeastern Alaska — that sliver of a panhandle adjoining Canada — is part of a temperate rain forest ecosystem. Its climate is moderate and the winters aren’t too severe. Thorne Bay’s town of the same name has a little less than 500 people and is located about 40 miles from Ketchikan on eastern Prince of Wales Island. The island is 140 miles long and 45 miles wide, the third largest island in the United States (Hawaii in the Hawaiian Islands and Kodiak in Alaska’s Aleutians are larger). The fishing in the surrounding saltwater and in the many freshwater rivers and streams is some of the best in the world for steelhead trout and the Pacific salmons. 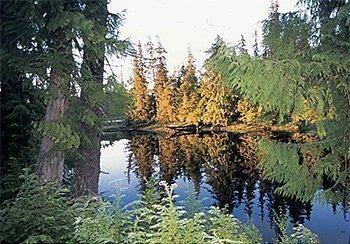 Plus there are hunting opportunities for black bear, Sitka blacktailed deer, and waterfowl. The salmons and the legendary steelhead, a sea-run rainbow trout, are main draws for light tackle angling with conventional, spinning, and fly gear. All five of the Pacific salmons can be caught in the saltwater, and all run up the island’s rivers and creeks to spawn, although there aren’t many Kings in the freshwater. Steelhead are caught on their spawning runs in spring and fall. Steelhead are sea-run rainbow trout that differ from their freshwater cousins by spending part of their lives in saltwater where they feed and grow to become large and strong, reaching an average of 6-12 pounds. They migrate into their natal streams and rivers to spawn. After spawning they stay in freshwater for a while, then move back out to sea, and repeat the process the next year. There are spring, summer and fall runs of steelhead, but spring is the best time on Prince of Wales Island for these majestic trout. King (Chinook) salmon are the largest of the five Pacific salmons that swim in North American waters. They are common up to 25 pounds with many larger ones taken each year. They have been recorded at over 100 pounds. Kings are found all year in waters around Prince of Wales Island, but are the most concentrated in saltwater in early to mid-summer when they are caught by jigging or trolling herring baits on or near the bottom. They seldom swim up the island’s rivers or creeks on their migrations. Silver (Coho) salmon average eight to 12 pounds, run in large pods of fish, and are a blast to catch on spinning tackle or a fly rod. In July and August they are the most active, although runs can continue into the fall. These fish, along with pinks, are my favorite fly rod targets. They readily strike streamers and often take topwater offerings as well. They’re plentiful, jump and fight well, and taste good. At times I’ve caught so many silvers that it was necessary to take breaks from fishing to rest a weary body. Sockeye (red) salmon are amazing creatures and they, of all the salmons, undergo the most pronounced morphological transformation from the sea to the spawning grounds. Bright silver and streamlined when they enter freshwater, the males turned into bright red, humpbacked fish with green heads; their jaws become severely kyped and huge sharp teeth emerge. The females turn red and green, but without the hump or kype in the jaw. Sockeyes, which average 4 to 8 pounds, only run up streams and rivers that have a lake as their headwaters; their young develop and mature in lakes. Chum (dog) salmon once had a poor reputation as a game fish, but that has changed in recent years. Caught fresh before they start deteriorating as they near the spawning areas, they are formidable on spinning and fly rods. They are seven to 15 pounds on average. This is the only salmon I haven’t tasted, but I suspect a fresh one is pretty palatable. I’ll need to do more research. Pink (humpbacked or humpy) salmon are the smallest of the Pacific salmons — six pounds is large — and run up rivers in thick pods. This silver fish develops a hump, kyped jaw with teeth, and turns from brilliant silver to dark olive, almost black as it approaches the time of reproduction. They are around summer into early fall. They readily take a fly and put up a good tussle on light tackle. Sometimes humpies are so thick and eager to bite that one tires of catching them, if you can imagine such a thing. All of the salmons and the steelhead like colorful spoons, spinners and streamer flies. Pink, purple, chartreuse and bright red seem to work best. But when they’re biting, almost any color, shape or retrieve will do; and the bite can be fast and furious if the time is right. And all can be caught in the saltwater during spawning migrations on lures, cut or whole herring, and occasionally with flies. Other fishes available in the saltwater are halibut up to 250 pounds, red snapper and other Pacific rockfishes, and lingcod. If you want to take fish home to the lower 48, the folks at Alaska’s Boardwalk Lodge will filet, freeze and pack your catch that may be carried home on the plane or shipped. 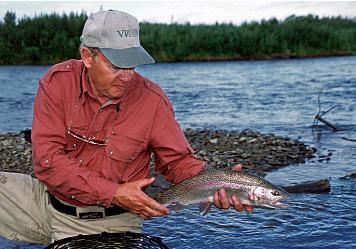 If you fish out of the lodge, all tackle is provided and most of it is quality Orvis gear. This includes fully-rigged rods and reels, waders and boots. Or you may, of course, bring your own stuff. The fly and gift shop has other items including a great line of lodge-specific clothing that is functional as well as ornamental; I wore my fleece vest with the lodge’s embroidered logo every day (and wear it a lot today). The lodge has a small fleet of comfortable fishing boats with enclosed cabins, heaters, and a head. All the conventional and spinning gear you’ll need is aboard. You just need to show up and listen to the US Coast Guard-licensed captain/ guide. On the short trip to the fishing grounds, you’ll see harbor seals and sea lions and have a good chance of observing porpoises, Orcas and humpbacked whales. Not to mention a myriad assortment of sea birds, waterfowl, and bald eagles. Bring your camera, too! Elizabeth and I fished the salt but prefer to fly or spin fish on streams and small rivers, and Prince of Wales Island is perfect for that. The island hosts hundreds of salmon and steelhead waters, and is crisscrossed with old logging and Forest Service roads that allow access to some pretty wild places. Some trails to streams are manicured, but most are bear and other game trails — often loaded with ripe salmonberries, thimble berries, Russian berries and others — that are fairly easy to navigate to prime fishing spots. The lodge guides drive comfortable Chevy Suburbans to the creeks and rivers, with drinks and lunch on ice. It’s a pretty fine way to get around. From the earliest known times, the Tlinget people resided on Prince of Wales Island. In the 17th century, a small group of Haida people migrated from Canada’s Queen Charlotte Islands — led by Raven it is said in the clan houses — and settled in the southern half of the island. Over the years, the two peoples interacted, intermarried, and influenced each other’s traditions, spirituality, stories and myths, and styles of carving totem poles. The modern day island, particularly in the settlement of Hydaburg, is home to many of the remaining Haida; only about 300 individuals are left in all of Alaska. There are totem parks in Kasaan, Klawock and Hydaburg, and some poles in Craig. The totem parks, along with other Native Alaskan cultural sites, are well worth a visit. The staff at Boardwalk Lodge can take you to these interesting and inspiring places if you want to take some time off from catching all those fish. “Raven’s Island,” you ask? In the Haida and Tlinget cultures, Raven was the creator, a bird, a spirit with a ravenous appetite for many things, a fool, a genius, and a trickster. He was — among accomplishing many other notable feats— responsible for the sun, moon, and stars that shine over the land. It seems a mean clan put Sun, Moon, and Stars in sealed boxes and hid them, plunging the world into eternal twilight. Raven tricked his way into the clan house, retrieved the boxes one by one and released the captives, who climbed back into the sky to lighten and warm the land. Haida and Tlinget live on Prince of Wales Island today. And when Raven wants a place to relax, fish, be with exceptionally nice people, and eat like a king — for Raven likes to eat well — he certainly changes shape and goes to the Prince of Wales Island and stays at Alaska’s Boardwalk Lodge. King Montgomery is a freelance outdoor writer, photographer and lecturer from Burke, Virginia. He tries to visit Alaska once a year to renew his acquaintance with Raven and Eagle, two spirits who accompany him on fishing adventures. Virginia Sportsman Magazine is Virginia’s premier publication for fishing and hunting. You may subscribe to this bimonthly by visiting their website or calling 1-800-734-2980.